MONTREAL -- Not only did Boston Bruins defenseman Zdeno Chara blast his way into the record books Saturday night, but he may have also laid the foundation for future Honda NHL SuperSkills competitions. The 6-foot-9, 260-pound Chara, a player on the hated rival of the team upon whose ice he stood, established a new standard in the Cisco Hardest Shot event when he skated into his second attempt and clocked 105.4 mph before a stunned, yet appreciative, crowd at Bell Centre. The cannon shot enabled the gentle giant to best a 16-year-old mark held by another former Bruin, Al Iafrate (105.2 mph), who set the standard as a member of the Washington Capitals. "I'm just glad the fans in Montreal recognized the whole point of the competition and I want to thank them," Chara said. "I know they are very passionate fans and they cheer for their own team and Boston is their biggest rival. We do play hard against each other, but that's part of hockey and what makes the game so great. The Eastern Conference and Western Conference return to Bell Centre Sunday evening (6 p.m. 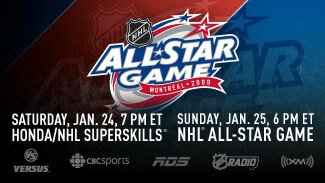 ET, Versus, CBC, RDS, NHL Radio, XM Radio) for the 2009 NHL All-Star Game. The Eastern Conference features four starters from the hometown Canadiens -- defensemen Mike Komisarek and Andrei Markov, forward Alex Kovalev and goalie Carey Price. Evgeni Malkin also will start for the East, but Sidney Crosby is sitting this one out with a knee injury, although he will be on hand. For the Western Conference, three Chicago Blackhawks, forwards Patrick Kane and Jonathan Toews and defenseman Brian Campbell, will be joined by a trio of Anaheim Ducks, goalie J-S Giguere, defenseman Scott Niedermayer and forward Ryan Getzlaf. NHL.com will have complete coverage of all the festivities and action at Bell Centre, so log in and check out the coverage. "But we also saw a soft and gentle side to these fans, and I'm very thankful for that." Not only did Chara wow the capacity crowd, he also had them standing and cheering in the end -- a sure sign they knew of Chara's heartfelt intentions to begin with. On Friday, Chara publicly stated he was going to donate $1,000 to his charity, Right To Play. Soon after, the five other shooters -- Sheldon Souray, Mike Komisarek, Vinny Lecavalier, Shea Weber and Mark Streit -- offered to do the same. Additionally, each of the players' respective teams -- Boston, Edmonton, Montreal, Tampa Bay, Nashville and the New York Islanders -- put up $1,000 each. The NHL and NHLPA matched the players' pot with $6,000 each to bring the total to $24,000 for Chara's chosen charity. "I basically got involved with Right To Play when (teammate) Andrew Ference got involved," Chara said. "I really liked the idea of going to Africa and trying to help children and families. I think it's a great charity program, and I'm happy to be a part of it. It's a special day and hopefully we can spread this into future events. I'm thankful to all the players, the hockey clubs, the NHL and the NHLPA for donating money -- and hopefully, we can do this at every All-Star event." The Hardest Shot competition required shooters to set up the puck 30 feet from the center of the goal; starting no further than the nearest blue line. The shooter had the opportunity to skate towards the puck and shoot it from its positioned spot into the goal with the fastest recorded shot of two attempts being scored. "Today's shot (105.4) is the highest I ever hit it," Chara said. "I've been clocked at 103 and 104 before and you always want to shoot the hardest, but getting the All-Star record is something I'm very proud of." Lecavalier, who finished second to Chara's 103.2 mph blast last year in Atlanta when he hit 101.9, finished a distant fifth this season (97.0). Edmonton's Souray, who registered a 106.7 on the radar gun at the Oilers' SuperSkills Competition earlier this month, finished third at 102.3. Nashville's Weber actually posted the second-highest shot of the night when he hit 103.4 on the radar gun on his second attempt. Montreal's Komisarek was fourth at 98.5 and Streit of the Islanders came in sixth at 96.0. "I knew (Weber) had a hard shot, but, really, all these guys have hard shots," Chara said. "I kind of had the feeling, though, that Shea and Sheldon would be right up there." When he found out that he had officially set the mark, Chara was humbled. "Records are made to be broken, and it's just good that now there's another standard and another level of competition for years to come," Chara said. "I knew the record was in the 105 range, but I just wasn't sure of the other numbers. The thing that I like about these All-Star skills events nowadays is the fact you can see guys are showing more and more bravery. They're not afraid to show moves and try things and if it doesn't work out, so what. In the past, guys were afraid to do things for fear it wouldn't work out. "Going out there and just having some fun is what has made these events even more entertaining for the fans."